Designer stubble faded from view along with shoulder pads and Miami Vice in the 1990s. After that, the beard was mainly for folk singers, real ale aficionados or members of the creative underground. Now, it seems, the beard or any kind of facial hair has been coopted by respectable classes. Bank managers, accountants and solicitors have been instrumental in the mainstreaming of beards. No one bats an eyelid at the guy behind the counter at the building society who looks as if he hasn’t shaved for a week. A year ago, we might have regarded him as scruffy and inappropriately un-groomed for a public service job. So it came as a surprise to me when the manager of Canada’s men’s hockey team for next month’s Olympics instructed his players to go clean-shaven. As you’ll imagine, the only Olympic sport that bans beards is boxing. And, as far as anyone knows, other members of the Canadian Olympic team can wear facial hair. But General manager Steve Yzerman – himself clean-shaven — has put his foot down. Fans of the National Hockey League (NHL) will know that there is a custom when teams progress to the playoff stage of competition: players shave only when they get eliminated. The playoff beard tradition was started back in the early 1980s. The President of Team Hockey explained: ““He [Yzerman] wants everyone to be respectable and we’ve never had an issue with this.” So one imagines Canada’s players will be understandably upset at this, particularly at a time when beards are accepted at all levels of “respectable” society. Perhaps they’ll realize Yzerman is hopelessly out-of-touch. The beard has lost its rebel aesthetic. It would be no surprise if David Cameron or Nick Clegg started cultivating hirsute chins any day. Will King, the British entrepreneur behind King of Shaves, the men’s grooming aids company, recently reported: “Sales across the shaving industry were actually down in the UK and US last year for the first time because of guys not shaving.” King blames the “celebrity beard” coupled with the recession. 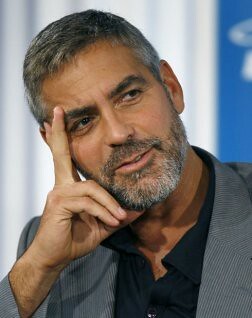 We’re used to the likes of George Clooney (above), Brad Pitt and Ryan Gosling appearing unshaven one minute and smooth-chinned the next. But there were gasps when Jeremy Paxman, of all people, sprouted a full set of whiskers, then shaved 147 days later. In the USA, Jay Carney, the White House press secretary, appeared on the briefing room podium sporting facial hair a fortnight ago. Conspicuous facial hair, it seems, is now consistent with conventionality, orthodoxy and accepted standards. This could mean the beginning of the end for facial hair, of course. When the aforementioned Paxman appeared on Newsnight in an open neck shirt, he immediately sent a generation of men searching for their ties, and, if they didn’t own any, their dad’s. Paxman, the epitome of uncool, could send the beard to oblivion too. 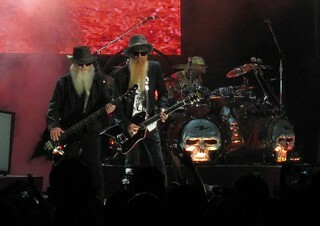 If so, King should challenge him to strive for the ZZ Top look (below); it will do wonders for shaving products sales. This entry was posted in Uncategorized and tagged beards, Canadian hockey, facial hair, King of Shaves, Miami Vice, Will King on 12 January 2014 by .